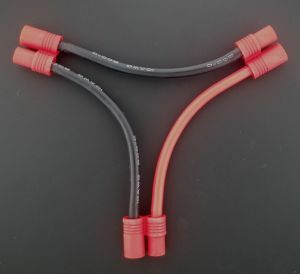 OSE 10 Gauge Series Y Harness for use with ose-qs6p bullet connectors. Using this will allow use of two batteries with the same ESC. Doubling the voltage to your esc/motor. Note: Using this will double the voltage of the system its used in.You must use two battery packs of the same exact specifications, age and quality. Failure to due so could cause a fire.